Identification: Genus is currently recognized as containing 15 species. McCosker (1989) provides a key to the five Anguilla species most likely to have been imported. Size: To over 200 cm. Native Range: Marine, estuarine, and fresh water. Most temperate and tropical regions of the world (Berra 1981; Nelson 1994). Table 1. States with nonindigenous occurrences, the earliest and latest observations in each state, and the tally and names of HUCs with observations†. Names and dates are hyperlinked to their relevant specimen records. The list of references for all nonindigenous occurrences of Anguilla sp. are found here. Means of Introduction: These eels were probably imported by Japanese or Chinese restaurants, or by fish farms, and the eels either escaped or were released (Williamson and Tabeta 1991; Moyle 2002). Status: Reported from, but failed in, California, Nevada, and Oregon. Remarks: There is some confusion concerning the correct identity of the eel taken from the San Joaquin River, California. The voucher specimen (SIO 64-219) is a skin only; it was reported as A. rostrata by Skinner (1971) and as being either A. rostrata or A. anguilla by McCosker (1989) (see species account for A. rostrata). 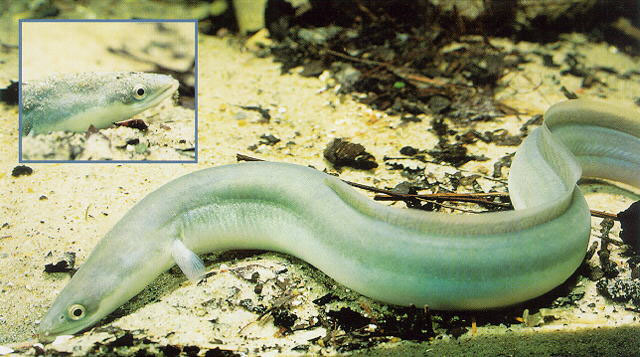 One of the three Oregon specimens was reported as being kept alive in an aquarium (as of 1990); the other two specimens were not preserved (Williamson and Tabeta 1991). Moyle, P.B. 2002. Inland Fishes of California. Second Edition. University of California Press, Berkeley, CA. 502 pp. Nelson, J. S. 1994. Fishes of the world, 3rd edition. John Wiley and Sons, New York, NY.